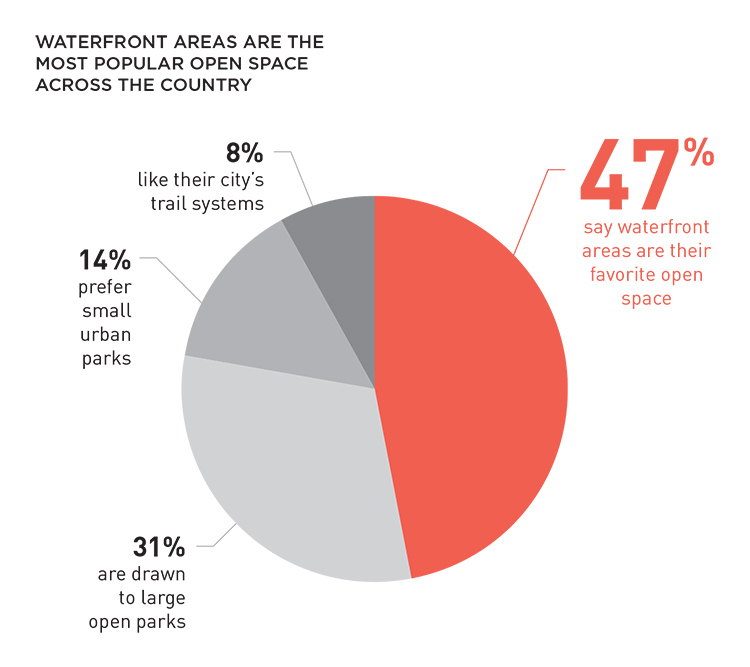 Of the 1,000 urbanites surveyed, 47 percent said they preferred their city waterfront to other open spaces. Image courtesy of Sasaki Associates. America’s move toward urban living can be seen as a step toward a more sustainable future, but it also unearths a host of questions for the people who must design these spaces. What are the things people living and working in these urban environments gravitate toward? How might that change based on what kind of city they live in? These questions stick with the designer on their endless drive to envision the ideal balance of humans, urban environment, and nature. Sasaki Associates recently published research on these questions in a report called The State of the City Experience, and it turns out some of the answers depend on who you’re asking. Sasaki surveyed 1,000 urbanites, ranging in age and income, from six cities across the United States (Austin, Boston, Chicago, New York, San Francisco, and Washington, D.C.). They were asked about four aspects of the urban environment—architecture, activities, parks and open spaces, and transportation—what they currently thought of their urban environment and what they would like to see in the future. “What is written about on cities is from the perspective of the designer, and we were interested in what people experience in the city, what the public might say about how we design city spaces…and how their experience might inform how we think about the design of cities,” said Gina Ford, chair of Sasaki Associates’s Urban Studio. For more information on the report, The State of the City Experience, contact Sasaki Associates at info@sasaki.com. Reblogged this on The Dreams Of Cities. Thanks for the post. 🙂 I enjoyed reading through Sasaki’s presentation as well!